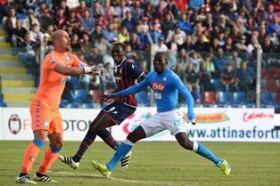 Simeon Tochukwu Nwankwo continued his recent good form in front of goal after finding the net for Crotone in their impressive 2-1 road win over Udinese in the Italian Serie A on Sunday. Following his heroics against the champions Juventus on Wednesday, manager Walter Zenga had no choice but to include the lanky striker in the starting lineup and he repaid the faith of the former Italy goalkeeper after scoring his third goal in four matches. Udinese netted the opening came after five minutes with a brilliant half-volley from the area by Kevin Lasagna but the lead lasted only two minutes, with Simy equalizing after Andrea Nalini delivered a teasing cross into the box. On 86 minutes, Marco Davide Faraoni reacted first on the loose ball and scored from close range after Nwankwo's shot from outside the area was blocked. With seven goals in less than two seasons, the former Gil Vicente and Portimonense frontman is now Nigeria's joint-sixth highest goalscorer in the history of the Serie A, along with Torino's Joel Obi. Crotone have moved out of the relegation zone following their victory over Udinese and have 31 points from 34 games.